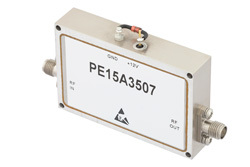 PE15A3507 high gain broadband amplifier from Pasternack is featured in our extensive in-stock RF amplifier selection. Our connectorized high gain broadband amplifier uses SMA connectors at 50 Ohm. This SMA broadband high gain amplifier has wide-band capability with a minimum frequency of 12 GHz and maximum frequency of 18 GHz. 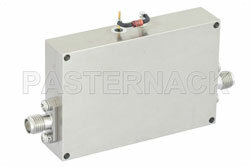 The typical gain of this broad-band high gain radio frequency amplifier is 43 dB. Pasternack broadband high gain amplifier PE15A3507 is rated at 1 Watt (30 dBm) P1dB, 2.5:1 input VSWR maximum and 2.5:1 output VSWR max. Our broad band high gain radio frequency amp is part of over 40,000 RF, microwave and millimeter wave components available from Pasternack. This coaxial broadband high gain amplifier can ship worldwide the same day of the purchase as with our other available RF parts.